Colin Shields was a close friend of the charismatic football manager Brian Clough for more than twenty years, becoming one of the few people - besides the players - who Brian would allow to travel on the team bus. From behind the scenes at TV appearances to carrying bags of laundry together on holiday in Majorca, even the mundane became memorable in the company of Brian Clough. Looking back, from the moment they met to Colin's last conversation with his famous friend, 'Champagne Memories' adds more stories to the Clough legend including his unbounded generosity and his intriguing unpredictability. In this fascinating account of life with the Master Manager, Colin describes many poignant memories of their friendship. Marcus Alton was still at school when he began writing a regular sports column in the local parish magazine, securing an exclusive interview with the new chairman of Nottingham Forest FC who lived in the same village. He then joined the Newark Advertiser newspaper, winning the title of Midlands Sports Journalist of the Year. He has worked for the BBC for more than 25 years and is a senior journalist. In August 2000, Marcus set-up the nonprofit-making website, brianclough.com. 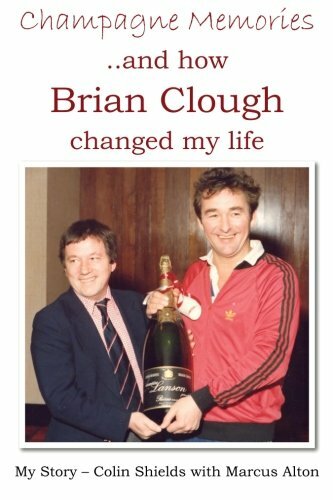 Marcus has written two previous books about Brian: &#x2018;Young Man, You&#x2019;ve Made My Day,&#x2019; and &#x2018;The Day I Met Brian Clough&#x2019; which includes memories from his family, friends and fans.